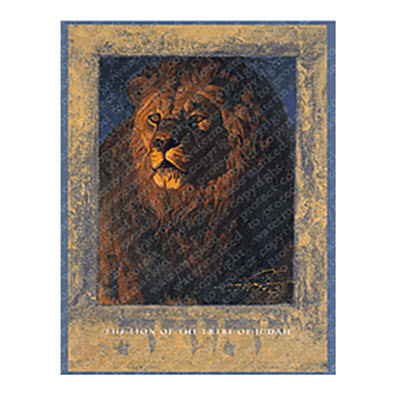 Abba Oil Ltd. - Lion of the Tribe of Judah Lithograph 8"x10"
Home → BOOKS & GIFTS → Books & Bibles → Lion of the Tribe of Judah Lithograph 8"x10"
Lion of the Tribe of Judah Lithograph 8"x10"
Signed by the Artist, this interpretive pointillism portrait captures the essence of the being, the majesty, and the Biblical qualities assigned to the Lion. The painting is subtitled "The Lion Revealed by Fire". This Lion was originally painted in acrylic on paper, the culmination of over 20 years of artistic observation both in captivity and in the wilds of Africa. The artist was struck by the majestic strength and spirit of the lion during his years of wildlife painting in Transvaal Province, Republic of South Africa. To capture the intense facial interpretation of this magnificent creature required an additional 52 weeks of face to face study of a lion in captivity. THE IMAGE ON THIS WEB SITE IS "WATERMARKED" TO PROTECT COPYRIGHT!! The actual print is not watermarked.